This Order has the characteristic shape of an elongated body, limbs and tail have and do not have a tympanum. The body can be distinguished between the head, neck and body. Some species have gills and others breathe with lungs. In this part of the eye there is a small head and in some types, the eye is reduced. Larval stage is almost similar to the adult stage. Members of the order Urodela live on land but can not be separated from the water. Spreading pattern covering North America, Central Asia, Japan and Europe. Urodella has 3 sub-orders are Sirenidea, Cryptobranchoidea and Salamandroidea. Suborder Sirenidae only have one family that is Sirenidae, while the sub-order Cryptobranchoidea have 2 families that Cryptobranchidae and Hynobiidae. Salamandroidea suborder have 7 family are Amphiumidae, Plethodontidae, Rhyacotritoniade, Proteidae, Ambystomatidae, Dicamptodontidae and Salamandridae. (Pough et. Al., 1998). Salamander has an elongated body and a tail. Most salamanders have four legs, although in some species of aquatic limbs obviously reduce. There are two tendencies are quite prominent in the evolutionary process is the loss Salamander (reduce) the lungs and the presence of paedomorphosis (the presence of larval characteristics in adult Salamander) (Pough et al., 1998). Very surprising if a terrestrial animal can survive without lungs but the largest salamander family Plethodontidae have characteristics that lack lungs. 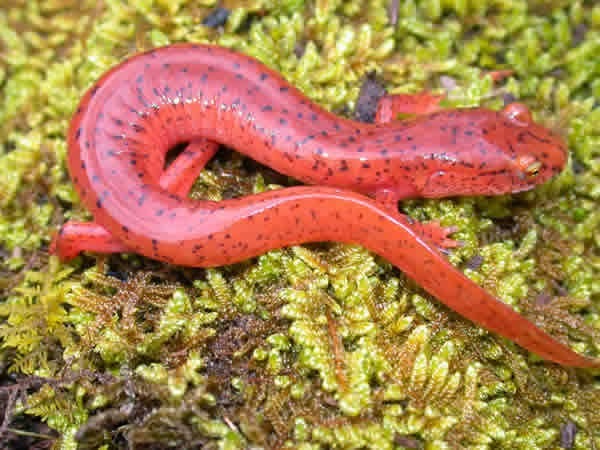 The absence of the lungs may occur on the skin due Salamander Salamander allows the exchange of gases. Several explanations have been prepared to show the advantage of the loss of lungs in Plethodontidae, the most readily accepted hypothesis relates to the loss of lung evolution is a specialization of the apparatus hyoideus contained in the throat as a mechanism to stick its tongue to catch prey. Hyoideus cartilage is part of the breathing apparatus on Salamander has lung. So the Plethodontidae, hyoideus apparatus which should act as a ventilator if she has lung been modified into a mechanism penjuluran tongue to catch prey because reducing lung. Members of Pletodhontidae capable of sticking her tongue out farther than the length of the head and the body are grouped in Bolitoglossine (Pough et al., 1998). Caudata or Urodela members possessed about 350 species, is limited in the northern hemisphere; North America, Central America, Central Asia (China, Japan) and Europe. Body shape each member Salamanders are very different, so it is easy to identify. Most of urodela family are in America and do not exist in Indonesia. Most of his life on land. No fertilization is external and there are internal. Reproductive ovipar and ovovivipar. Other traits that do not have a tympanum, have gills or without gills and small eyes or reduce (Pough et al., 1998). Salamander is an amphibian group that tailed. All members of this family have a long tail, elongated cylindrical body and a different head. Most have well-developed limbs, usually shorter depending on body size. Reduce the skull due to a few parts missing. Most of the members have internal fertilization, although none of the members of this family that have copulation organs. Internal fertilization occurs when the male depositing spermatopora which will then be received by the female through the lips kloakanya (Zug, 1993).